More seniors and vulnerable Albertans will receive care where they live, thanks to increased paramedic supports throughout the province. Associate Health Minister Brandy Payne announced a major expansion of community paramedic supports throughout Alberta. 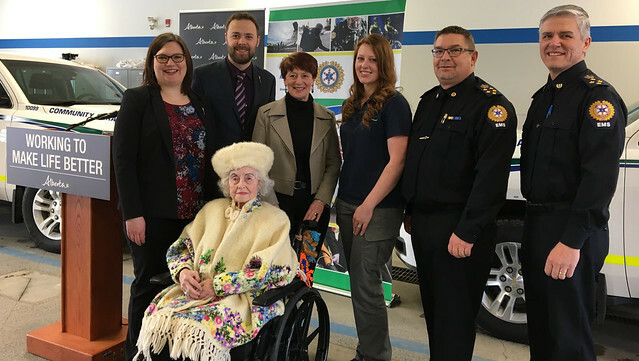 Mobile community paramedics provide on-site care to seniors and other Albertans with chronic conditions, reducing the use of ambulance transport, acute care beds and hospital resources. An $11-million expansion of the program will add 20 full-time community paramedics to the 30 already working in Calgary and Edmonton. These new paramedics will work out of dedicated call centres in Calgary and Edmonton to provide specialized support for vulnerable Albertans throughout the province. Another 26 paramedics will form new teams for home and continuing care patients in Lethbridge, Medicine Hat, Red Deer, Camrose/Wetaskiwin, Grande Prairie and Peace River. More than 90 per cent of patients referred to community paramedics can be treated on-site, as needed or on a regularly scheduled basis. Community paramedics are trained in sutures and wound treatment, diagnostics and electrocardiograms, IV treatments and blood transfusions. Paramedics consult with each patient’s doctor, but are also supported by on-call physicians. In 2017, community paramedics responded to 7,862 events in the Edmonton area and 6,802 in the Calgary area. When the program is fully rolled out, the new teams will support an additional 20,000 Albertans. New communities outside of Calgary and Edmonton were selected based on Emergency Medical Services (EMS) and emergency department admissions related to continuing care facilities. The Government of Alberta is supporting this expansion through the AHS Enhancing Care in the Community initiative.